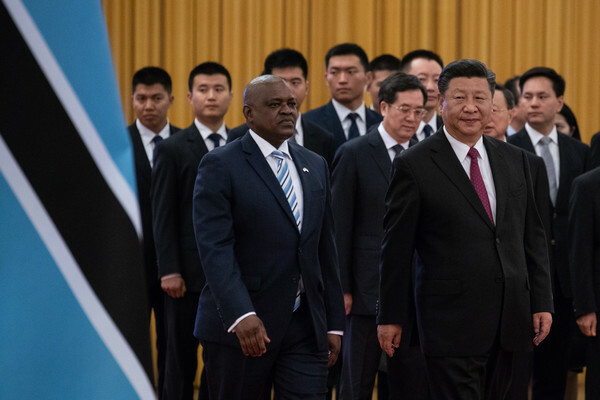 Chinese President Xi Jinping and his Botswana counterpart President Mokgweetsi Masisi agreed to take the two countries’ bilateral relationship to a higher level and deepen cooperation under the Belt and Road Initiative after talks at the Great Hall of the People in Beijing on Friday. The Botswana president is in Beijing for the Summit of the Forum on China-Africa Cooperation (FOCAC) from Sept. 3 to 4. Xi told Masisi that the two countries should enhance mutual trust and deepen cooperation in order to promote their ties to a higher level. He said he visited Botswana eight years ago and had felt the friendship between the peoples of the two countries. Speaking of the Belt and Road Initiative, Xi said China welcomes Botswana’s participation in and support to the infrastructure and trade framework. Masisi echoed Xi’s calls by saying his government supports the Initiative and is willing to expand collaboration under the FOCAC framework. The two leaders also witnessed the signing ceremony for a series of deals. Last year, trade between China and Botswana reached 267 million US dollars. China’s investment projects in Botswana were valued at over 101 billion US dollars at the end of 2017.